[tweet_dis]Development of the $1 billion Coomera Town Centre has been given the green light to proceed, after government funding for a crucial access road was announced[/tweet_dis] this week. Deputy Prime Minister Warren Truss and Queensland Deputy Premier Jackie Trad announced that the Federal and Queensland governments would deliver $57.4 million worth of funding for the upgrade of the Coomera Interchange (Exit 54) on the Pacific Motorway, ensuring the new commercial and retail precinct will go ahead. Developers Scentre Group and Queensland Investment Corporation will contribute $17.3 million towards the upgrade. Mr Truss said construction on Stage 2 of the interchange upgrade would begin later this year. “The announcement today of the funding partnership between the federal and state governments, along with the developers of the Coomera Town Centre, will see work commence on reducing congestion through this busy interchange,” Mr Truss said. Ms Trad said the new exit would provide direct vehicle access to the new Coomera Town Centre where investment worth an estimated $1 billion is in the pipeline, including a new Westfield Shopping Centre. “The Coomera Town Centre is an exciting development for the Gold Coast and the Queensland Government’s contribution to the new M1 exit will help in the development of a dynamic commercial and retail precinct. “This major precinct will stimulate economic growth in the region and create jobs for local workers at a time when jobs and job security are more important than ever. Federal Member for Forde Bert van Manen said the project would improve traffic flow and also deliver a number of benefits to the local community. “This upgrade will provide the road infrastructure needed to enable the successful development of the Coomera Town Centre, a welcome boost for jobs and community life in the local area. The master plan for the Coomera Town Centre, covering 680 hectares, was declared by the former Labor Government in December 2009. The Town Centre area, based around the Coomera Railway Station and incorporating the Dreamworld theme park, is projected to ultimately provide around 25,000 new dwellings, housing an extra 50,000 people. 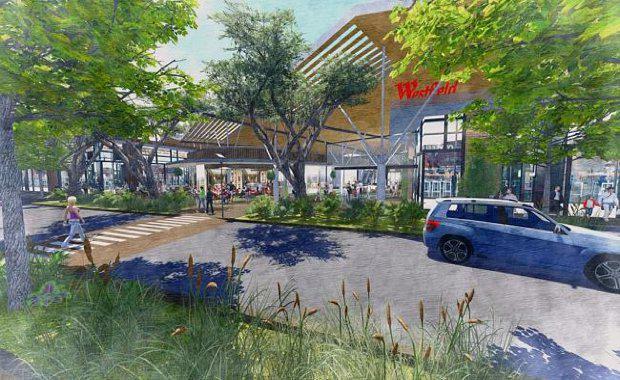 The proposed Westfield Shopping Centre at Coomera has the potential to generate more than 1,200 jobs a year over a two-year development period and around 3,300 direct and indirect jobs a year after that. Main Roads and Road Safety Minister Mark Bailey said the new exit would improve traffic flow and ease congestion at what is already a very busy interchange. Mr Bailey said roundabouts would be upgraded with signalised intersections to reduce queuing on the motorway ramps and a northbound exit loop ramp would provide an easier connection to Foxwell road (east). The southbound off-ramp would be realigned to intersect with the Old Pacific Highway service road. “Depending on no major weather events, the road upgrade should be completed by the end of 2016, in time for Westfield’s planned opening of its new Coomera Town Centre development,” he said.